Economics is more than simply the cost of a gallon of milk. Economics is also the science of society, the basis upon which a civilization functions at its most basic level. Productivity, commerce, and value all are essential elements that define and affect a community deeply. 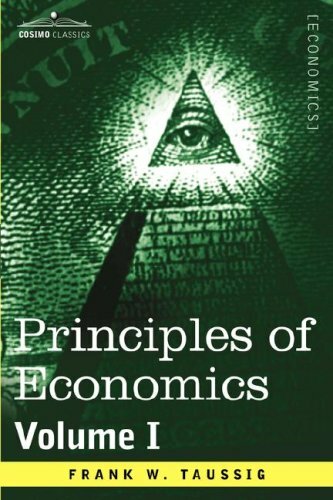 Eminent economist Frank W. Taussig brings the complex and sometimes intimidating subject to light in Principles of Economics (first published in 1911) by writing for the specialist as well as those with a simple educated curiosity about economics and its relevance to every member of a community. In this two volume set, he focuses on labor, production, banking, trade, the distribution of wealth, wages, problems in economics, and taxes. By sacrificing no scholarship while ensuring the subjects are accessible, Taussig presents an invaluable treatise on the science of society. American economist FRANK WILLIAM TAUSSIG (1859-1940) was professor of political economy at Harvard University, longtime editor of the Quarterly Journal of Economics, and an advisor to U.S. president Woodrow Wilson during World War II. He is also the author of Elements of Political Economy (1884), The Tariff History of the United States (1888), and International Trade (1927).